SSW: So our readers can get to know you, would you please share some background information about yourself. CASEY: Well, my name is Casey Cainan, I was born in Denver CO in '76 to a pressman father and stay at home mother. 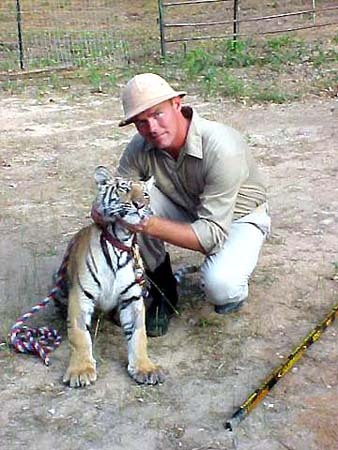 I am an animal trainer/singer songwriter. I now live in Paris, TX with my wife, daughter, and our animals. We are on the road an average of 10 months a year, and home the other two. I have Casey McCoy's Texas Tigers “Best little cat act in Texas" and my wife has an act with five American Eskimo Dogs. 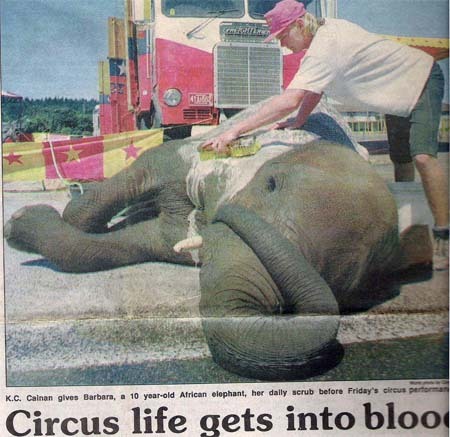 She is the daughter of famed circus ringmaster Phil Chandler. SSW: How long have you been an animal trainer? CASEY: I trained my first dog when I was thirteen years old, so eighteen years I guess. SSW: Where did you learn to work with animals? CASEY: I have had a knack in my life for being able to watch someone work an animal and pick apart how they got there. A lot of people taught me things, even when they were trying not to. Wayne Franzen helped me train my first animal, Goober (Collie Lab mix) he would see me in the tent trying to make the dog do things, and then give me a helpful hint here or there. He would constantly remind me "You have to be firm, but fair". SSW: You began with training dogs, how did you make the leap to bigger animals? CASEY: I was always begging Wayne to let me train a pony; finally he was sick of listening to me. He told me if I wanted to train a pony, I would have to train the petting zoo to do an act. I proceeded to train 4 goats, 2 pigs, a sheep, and a Holstein steer. I was fourteen when they worked. SSW: What animals have you worked with? CASEY: So many, I couldn't possibly write it all out. Most of your traditional circus animals. I also spent time as a trainer in Hollywood, training things you wouldn't on a circus; mice, Parrots, lots of small primates, Sea Lions, Giraffes, and a Gorilla at a zoo. SSW: Are there any other animals that you would like to work with? CASEY: Nothing really comes to mind. Maybe train an attack Coati. SSW: Who or what influenced you to become an animal trainer? CASEY: Wayne Franzen and Wilbur Behn, they could do so much with animals. SSW: What circuses have you performed with? CASEY: Culpepper & Merriweather, Franzen Bros., G.B Waltens Circus Extravaganza, Paul Lee Magic Show, Starr Bros., Bailey Bros., Hendricks Bros., Kelly Miller Bros., Universoul Circus, Clyde Bros. Johnson, Hubeler International, James Christy Cole, LE Barnes & Bailey, Circus Valentine, Bozo's Circus (TV shows count?) and Coronas of Hollywood. When I was fifteen, this guy named Tom Baines and I took out a little tent show called Peppercorn Family Circus, but we only made 4 weeks. SSW: When did you first become interested in the circus? CASEY: The first show I ever saw would have been when I was 6. It was Big John Strong, my uncle Curtis was working there. I remember thinking it was neat, but later that year we went to see Ringling Bros Barnum & Bailey. Needless to say, I wanted to run away and join out that day. SSW: What made you decide that this was the life for you? CASEY: When I was nine my folks were on their second attempt at getting back together (their first divorce didn't work out, it is however SOLID now). So they took me and my sister to join Culpepper & Merriweather Circus in Buckeye, AZ. I still am not sure why they thought this would make their marriage work, but it didn't. About two weeks out of winter quarters my mother has had enough of living in a trailer that moves every day, and doesn't always have water or electric. She decides to leave; my father is going to stay. They give me the choice stay on show with dad, or go to school with mom. "I ain't no dummy" I picked show-biz. SSW: During those early years on the circus, what were some of the jobs you held? CASEY: My first year not much. I was a little kid and everyone is always worried about kids getting hurt on a show. My uncle had a dog act, goat act, and liberty ponies. So I shoveled a lot of dog and goat crap. Not pony crap, they were dangerous outfits. I got to lead a couple of ponies into the ring for their act. I set up nov stand for Zajieck and B.J. the clown (till Jim fired me). Later my uncle and I went to went at Behn's Game Farm in WI where everything was a dangerous outfit but I got to get around some bigger animals. SSW: How did your time on the circus impact your childhood and time with your f amily? CASEY: It was rough. After the first year when school was in we would show on school grounds. I was starting to miss interaction with kids. I asked my father to send me back, so could go to school. So began the process of winters in Ogden Utah, summers with Uncle Curtis on a show. By the time I was thirteen, I was sick of school, and wanted to stay on the road. I made my mother and teachers as miserable as possible, in hopes they would send me away. Eventually it worked, but it was tougher than you would think. 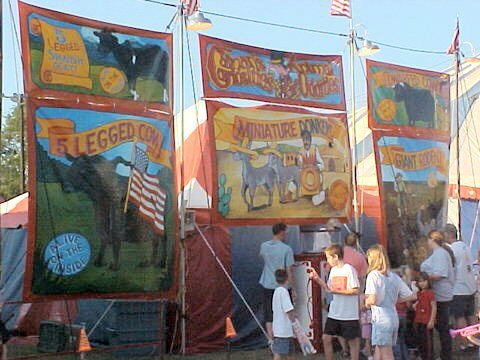 SSW: As a kid spending time at the circus, what fascinated you? CASEY: All of it, when I was young I was most fascinated by the human acts. The two I remember the most were, being shocked, seeing Tavana Luvas spin, hanging by her teeth, on a trapeze. And being amazed watching Red Johnson eat fire and somehow not burn his mustache. As I got older I was more drawn to the animal acts. I was lucky to spend time around some great trainers. Fess Reynolds was the first; we wintered near him in Buckeye AZ. He had big Brahma Bulls working at liberty. Then Wilbur Behn, who I couldn't understand a word coming out of his mouth, but yet this cage of lions got all of it, and did what he said. The best in my opinion was working for Wayne Franzen, when I was a kid, it seemed like he could get any animal to do anything. SSW: What was special about Mr. Franzen? What in particular did you learn from him? 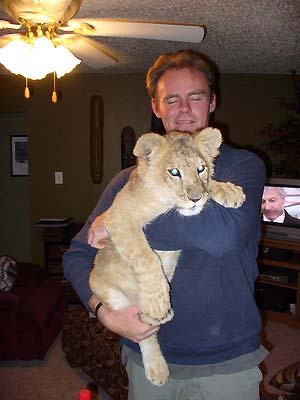 CASEY: Wayne had not only a gift as an animal trainer, but he was a trained high school teacher as well. He loved training people and animals. I must say he had far more patience with animals than humans. I learned to stay calm, no matter what is happening, and to enjoy chaos. SSW: You basically grew up working in the circus. How did you end up with your own animal show? CASEY: I started buying my own animals when I was seventeen. I bought a zebra, and a camel. 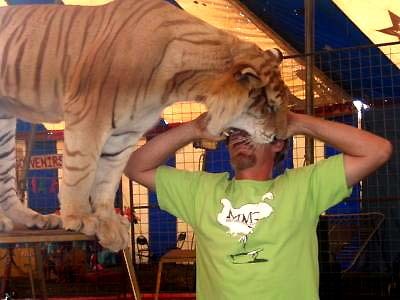 My cat act was pushed on to me by the guy who owned a circus. His cat trainer blew the show, leaving some cats, and the owner paid me to take them in. SSW: How long have you had your own show? CASEY: I have had this cat act going on 3 years now. SSW: Please tell us about your animal show. 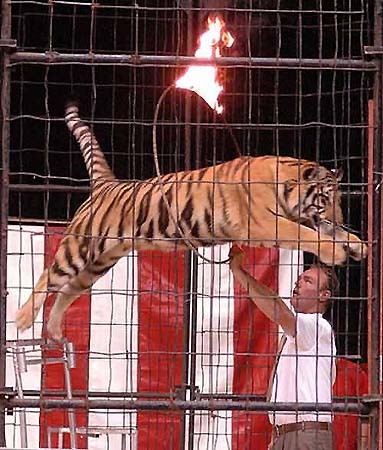 CASEY: It consists of four tigers in a 30' arena, doing tricks. SSW: Do you perform solely with a circus or do you take a show out independently? CASEY: At this point just circus. We are however framing a fair unit, for the ‘09 season. SSW: You have spent some time running a circus sideshow; please tell us more about that. CASEY: In 2000 I was in the process of acquiring a large menagerie, and a man came to the circus ticket seller, wanting to sell a goat with five legs. She brought the guy to me, and my first attraction was in business. Over the next 4 years I acquired a bunch more exhibits. I had all my banners painted by Bob Rawls. It was a 60' chain top banner line. Unfortunately, I added to much to too small of a midway, and it couldn't support itself. SSW: Why did you decide to get into the sideshow business? CASEY: I had always been intrigued by side show acts. One of the first circus skills I taught myself was fire-eating, I was 13. SSW: What sideshows have you seen? CASEY: I saw bunches when I was younger, that I, sadly, can't remember. In recent years I have visited Ward and Chris WOW, Zajieck's BCS, and Little John Strong’s Show. SSW: Was there anyone in the sideshow world that was particularly impressive or influential to you? CASEY: Jim Zajieck has really impressed me with his show in the past few years; I mean to say the way he has built it up, and the quality of the show. It is the nicest front I have seen. I s’pose there are nicer, but I haven't seen them. SSW: Are you also a sideshow performer? CASEY: I have, in a pinch, performed Blockhead, fire-eating, fire-breathing, assorted illusions, bed-o-nails, glass walking, and my personal favorite Hippidy Hop Rabbits. SSW: How/where did you learn these stunts? SSW: Where did your sideshow travel to? Were you traveling with a big top show or independently? CASEY: It was mostly on tented circuses. We did make the State Fair of LA., and a couple small county fairs in MS.
SSW: What happened to the show? Do you plan on taking it out again? CASEY: Most the live attractions have been sold. I do still have a live five legged cow. The tent and front are packed away; will probably stay that way. SSW: You are also a musician, how did you get started playing and writing music? 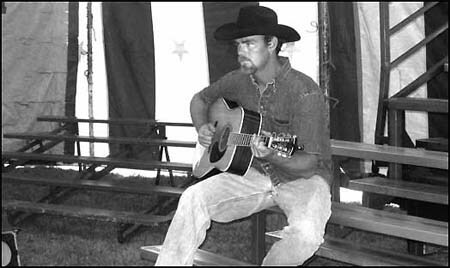 CASEY: I have a great friend (Michael Oneal) who is a songwriter from Paris, TX. I had always had a guitar around, and he ran an open mic in town. I would play a few covers from time to time. Then one night while we are having a beer, I am telling him stories about the stuff that happens on a circus, and he says "man, you got a million songs in your head, you should write them down" I went home that night and put down Two Shows and A Plane Ride, a song about hearing the news, when Wayne Franzen was killed by a tiger during a performance. It just kinda went after that, now I hear songs in everything I see and do. SSW: What genre is your music? CASEY: I guess it would be Americana or Folk maybe, I am not sure. I got a little of all of it. SSW: Where do you get your inspiration for your music? CASEY: Usually from stories or things that I see happen. From things that really pissed me off. I could see myself being a political writer very easily. Politicians can really get the creative anger going at times. SSW: Where can our readers find your music? SSW: You've done a lot of things in the business. What do you like best about it? CASEY: Some of the people in it, and I like the fact I can do other things, if I am bored with something. Show-biz has many roads, and you can change direction at any time. SSW: What do you like least about it? CASEY: Some of the people in it! SSW: What are your plans for the 2008 season? CASEY: We will be touring Mar. till Oct. with the Al G Kelly Miller Bros Circus, with a Shrine date sprinkled in here and there. SSW: Do you have any advice for someone coming into the business? CASEY: Don't, unless you have to. 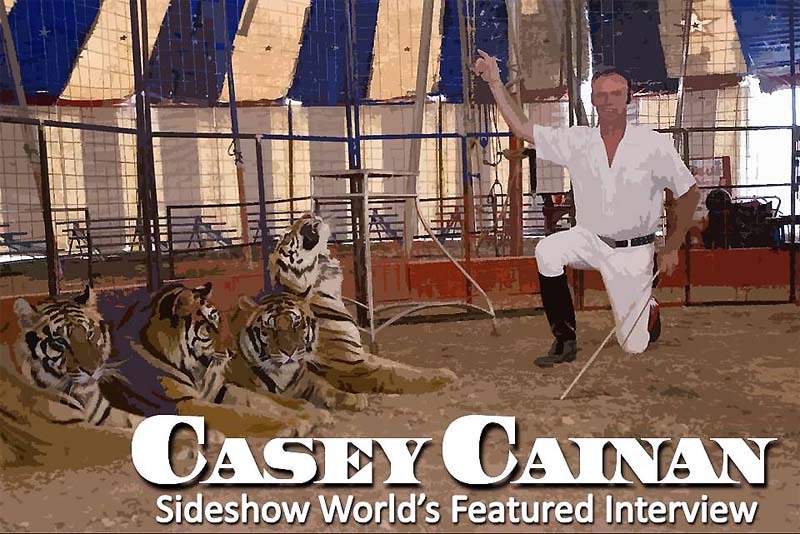 If you have to, remember this saying "I love the F-ing Circus, and the Circus loves F-ing me"
We'd like to Thank Casey for his time to do this interview with Sideshow World. 7 Casey - The Show Must Go On!